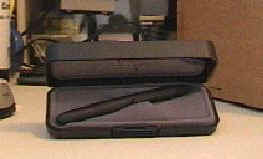 This was the first stylus I pulled out of the box from "Stylus Central". At first I just thought that this was another stylus, just with the name "Space Pen" because it's futuristic look. Upon reading the included information sheet, I found the pen inside this stylus was in fact a real Space Pen (you know, write anywhere, even upside-down or underwater). But we really aren't worried about the pen. The designed placed the stylus on the tip of the cap. This is a good way to go because you don't have to really worry if it pen or stylus because you can easily tell if the cap is on. This was the densest (heaviest for it's small size) of any of the styli I had received. At first I though heavier would be better, I soon found out this was not this case. On a soft screen, you didn't want to press like you might with another, lighter stylus for fear of cracking or damaging your screen. Because of this the motion in your writing becomes more jumpy (or at least it did for me). It also writes harder because the tip is much harder plastic then most tips. Space pens are normally very neat, but this ones combination with a stylus isn't all it is cracked up to be. Though I wouldn't consider it bulky, it's wait is a defiant minus along with its hard plastic stylus tip. Download apps pc app for pcs best apps.